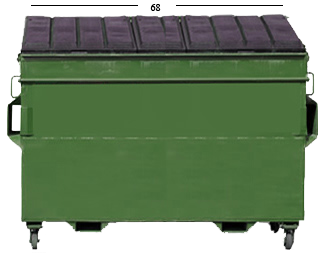 Temporary Containers | Loren's Sanitation & Recycling Service, Inc.
We offer two temporary container sizes for special clean up projects. Important – Please print and fill out our liability release form prior to delivery of drop box. Email to Lorens@lorenssanitation.com or fax to 503-393-2326. Rates are based on a monthly rental with four once-weekly dumps. The price is the same even if you only have one dump, but we can also pick up boxes, bags or piles if you don’t have enough material to make getting a container for a month cost effective. Call us for a free estimate on the most economical disposal options. Available for seven days per customer, including delivery and removal of the full container. There is an additional charge if an extra dump is needed within the seven days. Delivery and pick up is Monday through Friday. Please do not overload the containers. If you have extra items that do not fit in the container, place them next to it and let us know so we can pick them up. Additional charges apply for anything over a level fill or outside of the container. Appliances, tires, batteries, concrete, rocks, sod, sheetrock, paint.